Being a vegetarian in Japan kind of precludes one from most of the 'weird' culinary experiences so many people have when visiting or living here (raw chicken or horse sashimi, fugu, dancing shrimp, Kobe beef etc...). However never fear, there is enough weirdness to go around, even for us! 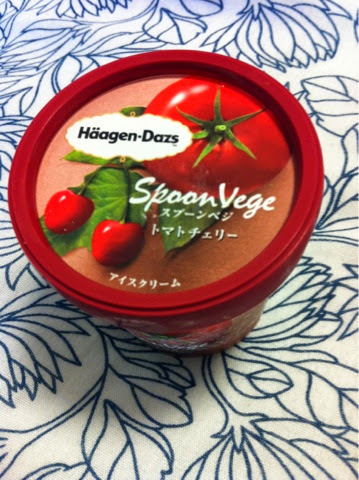 One of the oddities I have come by recently is the new 'SpoonVege' ice cream from Haagen-Daaz (which comes in cherry/tomato and orange/carrot flavours). I tried the cherry/tomato version, which was interesting. I have actually had tomato softserve in Aizu before, and this was a much richer version thereof. I could barely make out any cherry in the mix, but it was certainly not unpleasant. I intend to try the carrot one as well, to see if the fruit flavour is more noticeable. 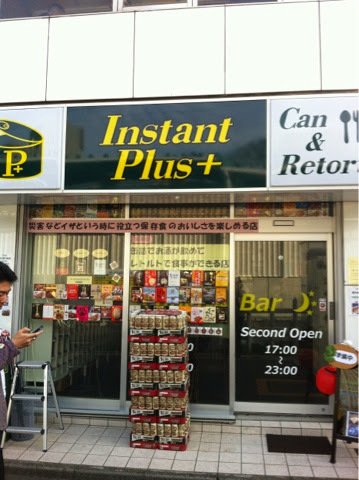 The second interesting spot is a 'instant curry' and canned food restaurant (if one can use that term) right near Ekoda station. They have a HUGE selection of curries, from vegan curries from India to grape-flavoured curry from Yamanashi, and everything in between). They provide rice, drinks and, if you need something extra, lots of canned delicacies (from the usual yakitori, to more exotic things like snails and dolma). Sounds like a fun, cheap night out to me! I tried the cherry tomato one. It wasn't as weird as I thought it would be.